Pretty much all my life, I have had a natural inclination towards encouraging others. I want people to feel good about themselves and about life. I want people to know that they have value and worth. I wasn't necessarily able to articulate it this way when I was a kid, but I have definitely been a natural encourager for most of my life. I don't say this to brag. Plus, even though it does come naturally, I still have to work at it to keep being that way when I don't feel like it. And I am also much better at encouraging others than I am at encouraging myself. I believe that my inclination towards encouragement is a spiritual gift from God, and I believe that each Christian has a gift that God has given them that they are particularly good at. But that being said, I also believe that anyone has the ability to be an encourager. Sure, it is more natural for some people, and some people will just never be as encouraging as others. But just as I can become a more patient person through practice and prayer, a person who struggles to be an encourager can learn to encourage. Anyone can learn to be encouraging, it just may take some extra work and a little bit of help. And that's where I come in! For the past year, I have had an idea for my blog that I kept putting off. And if you read my new year goals post, you'll know what that thing is: a free, mini-devotional/inspirational series. Plus, I have also been wanting to put together an email newsletter to go out weekly. 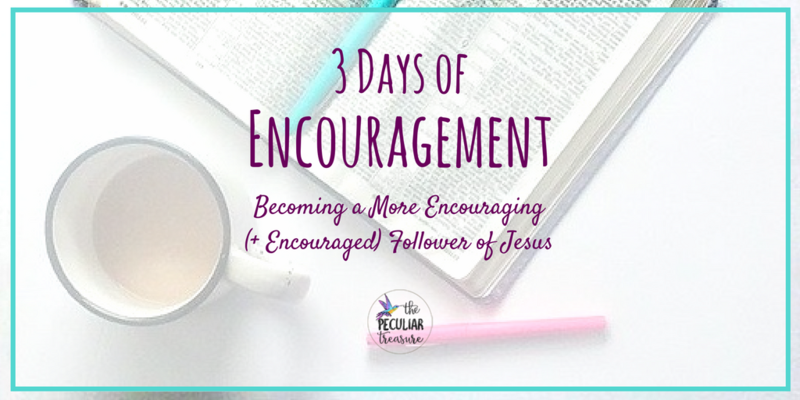 Enter Three Days of Encouragement! 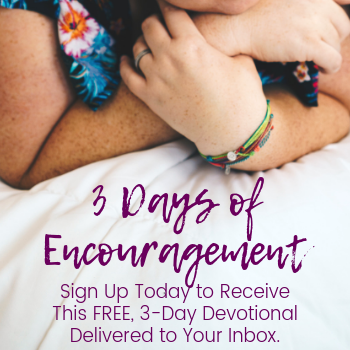 Three Days of Encouragement (3DE) is a 3-day, mini-devotional email series that is geared towards how to better encourage others and ourselves. 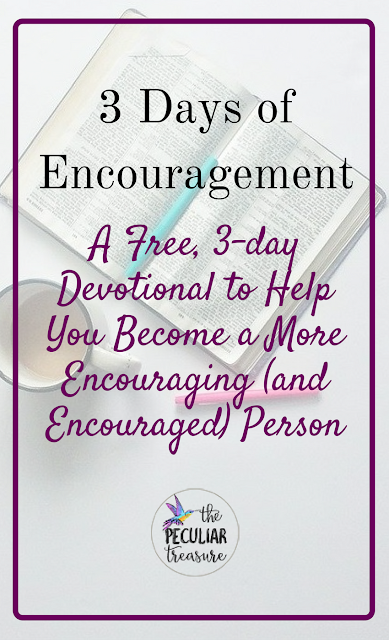 If you struggle to be an encouraged person, struggle to be encouraging to others, or just want to grow in those areas, 3DE can help with that. 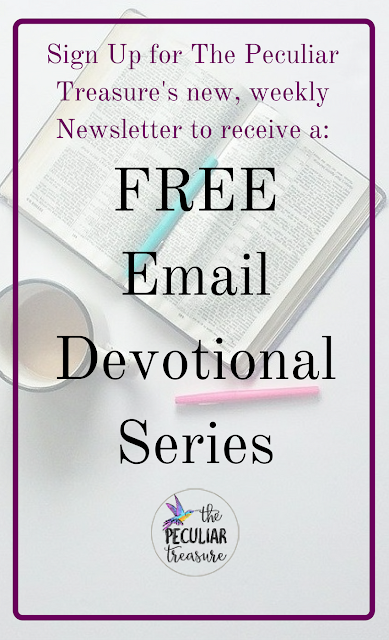 When you sign up for 3DE, you will receive an email a day for three days, each with an inspirational, faith-based post that is designed to help you become a more encouraging (and encouraged) person. Signing up for 3DE also means signing up for a weekly email newsletter from The Peculiar Treasure. This newsletter will come on the weekends and will include a short, weekly-happenings recap and a small scripture and devotional for the week. I will never spam your inbox. Like I said, friends: I don't want to spam you or give you one more useless email to delete. Ain't nobody got time for that! But what I do want is to be a weekly source of true encouragement for you. 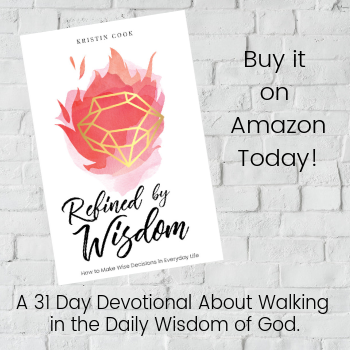 I want to provide a simple, easy to read devotional that you look forward to and come away feeling a little stronger and more encouraged. I want to be a part of your life in a meaningful way. I want to give my readers that extra boost they (you) need. I really am excited, guys! This has been a long, nerve-wracking process, and I am hopeful that you will love my first-ever freebie! I really appreciate your readership and your continued support and I hope that I can continue to add value to your life with each post I write and each newsletter I send. So, don't be shy! Go ahead and sign up for my weekly newsletter in order to receive 3DE for yourself. Congratulation on your new newsletter. You are already accomplishing goals for 2017. Signed Up!! I love this, and I am glad you finally decided to go for it! Super excited to peek in my inbox now! As I go on the job hunt I could definitely use some encouragement right now. May God continue to bless your gift! Awh YAY! I am SO pumped for this, Kristin! Just signed up! What a great thing to offer!!! Sometimes we all just need that extra encouragement. I signed up!!! Way to step out and go for it! Very excited for you Kristin! Congratulations on your newsletter. I hope it's a great success for you! Beyond excited for you, Kristin, and can't wait to see what you have to share with us via your newsletter! Congrats on the newsletter! I've been dying to get one started for a while now, but the timing is never right. 2017 already looks like its going to be a good year for you! This is so exciting! 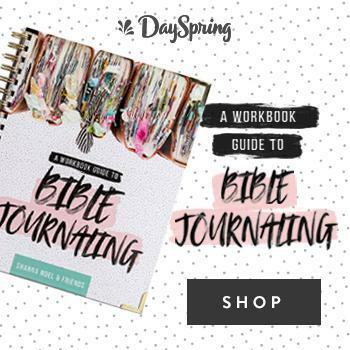 I love devotionals and I can't wait to join yours! That's incredibly exciting! It's really fantastic what you've put together. This is awesome!! It's always great to let people know how worthy they are. I'm always up for encouraging others to believe in themselves. How cool! Congratulations on your newsletter. I love the idea behind it!